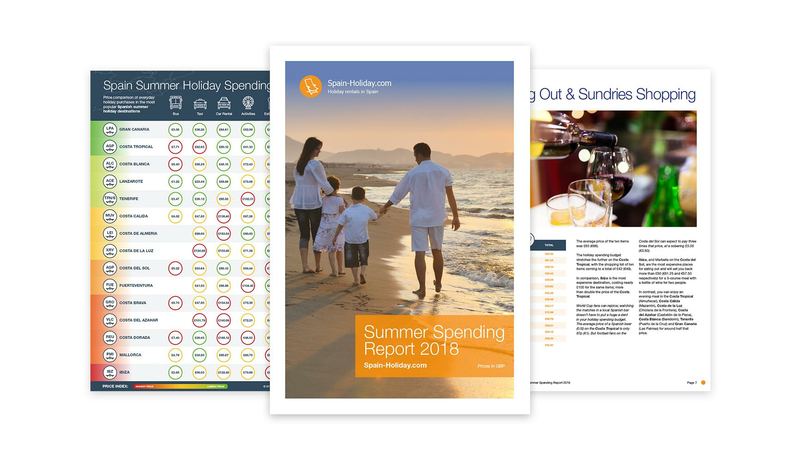 The Spain-Holiday.com Annual Summer Spending Report 2018 looks at the average price of everyday holiday purchases in the top 15 summer holiday destinations in Spain. The overall best value destination is Gran Canaria where a week’s car rental costs €74.26 a two-course lunch for two €16 and entrance fees to a family-friendly attraction costs just an average of €20. The Balearic Island of Ibiza tops the list of the most expensive destinations in Spain. Costa Tropical comes out on top for the price of beer in a bar at just €1 for a half liter. The average price for a 3-course meal for two, with a bottle of wine is €35. Ibiza is the most expensive for dining out, at €61.25. A family of four staying on the Costa Blanca can hire a car for less than the return price of the bus from Alicante airport. The best value waterparks can be found on Ibiza, Costa Tropical, Costa Blanca, and Lanzarote costing an average €18.50, €19.00, €20.24, and €21.75 respectively for an adult day pass.